I noticed this quote on the banner of a fellow bloggers page (emilyevans132.wordpress.com). I love this statement because it’s easy to get caught up in the muck of life and wallow in misery. But if we live like it’s heaven on earth we are able to dismiss our troubles and embrace the joyful life God wants us to live. 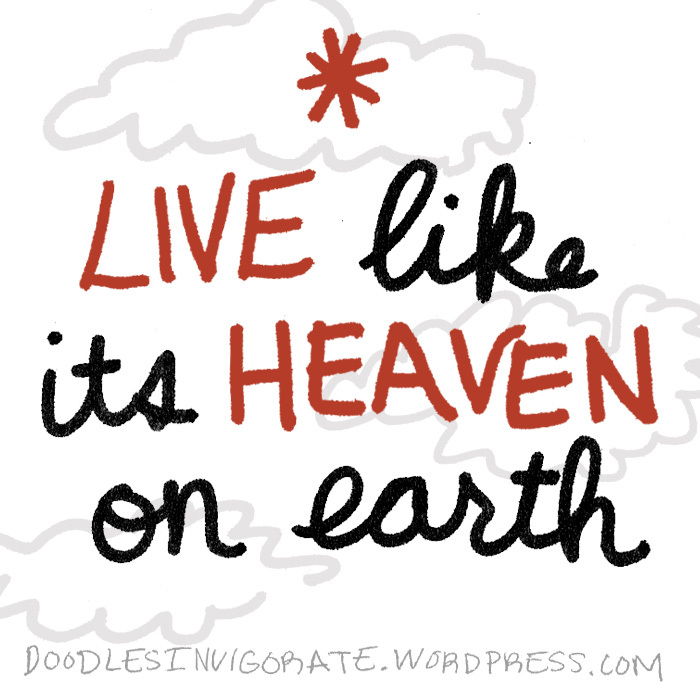 Live like it’s heaven on earth! Lovely! Thank you for posting! Such positive energy and a wonderful image! I love your blog…it seems to be full of such wonderful and powerful wisdom! Up here in the NE Oregon mountains, there is a small town named Joseph, that has a wonderful sign as you enter town: We think our town is heaven, so please don’t drive like hell through it. I’m glad you are enjoying the doodles. Ha ha! That sounds like a great town. I’m going to have to visit one day!